Bramhall, UK — Significant progress has been made in trialling and developing new designs aimed at greatly improving the recyclability of flexible packaging, according to resource recovery specialist Axion Consulting, which is leading a collaborative R&D project involving high-profile global brands. Axion is working with a number of partners on the „Reflex project“, a two-year innovative project that is co-funded by the UK’s innovation agency, Innovate UK. The project has just launched a new website. “We are making significant progress. For example we have taken multi-layer packaging structures that currently use incompatible polymers and we have redesigned them using polymers which can potentially be recycled together,” noted Axion’s Project Engineer Richard McKinlay, after speaking at the Plastics Recycling Expo (PRE) in June. In his presentation on „How to design flexible packaging films which CAN be sorted for recycling“, he outlined the latest breakthroughs from the project, which has attracted high levels of interest from Europe and internationally. Much interest has been shown by other brand owners, non-governmental organisations and packaging suppliers. Another success includes optimisation of NIR (Near Infra-red) sorting technologies to detect and separate mixed polyolefin (PP and PE) packaging, such as sweet wrappers, crisp packets and bread bags. This has broadened what can be sorted and separated for recycling from mixed post-consumer flexible packaging. Capturing this mixed polyolefin packaging would divert more of it from landfill, while opening up interesting new options for the types of recycled polymers that could subsequently be made from it. 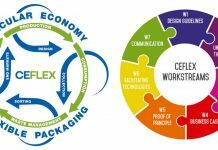 The „Reflex project“ aims to create a circular economy for flexible packaging in the UK by involving the whole supply chain, from polymer production and packaging manufacture to waste management and recycling. Flexible packaging such as plastic bags, confectionery wrappers, frozen food bags and pouches makes up nearly a third (32 percent) of consumer plastic packaging in the UK, however virtually all of this 414,000 tonnes produced annually ends up in landfill or energy recovery. By contrast 58 percent of plastic bottles are recycled. Further studies will follow into how flexible packaging can be reprocessed into high-quality recycled plastic pellet suitable for use in the manufacture of a wide range of products. It is anticipated that the market will follow a similar model to that for plastic bottle recycling and take ten years to mature to a point at which more than 50 percent of flexible packaging is diverted from the waste stream.